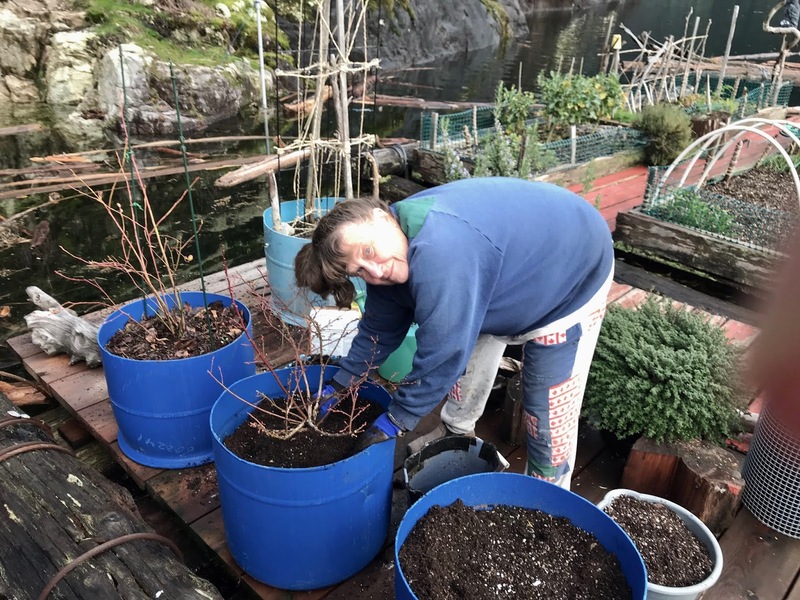 Blueberries in pots on the cabin deck. 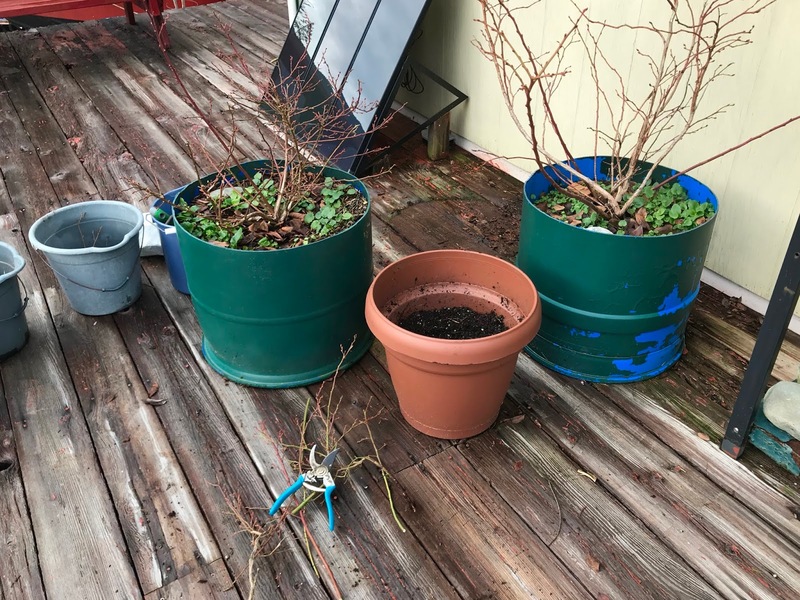 My blueberry bushes have had several homes over the last three years. To get ready for their fourth summer, I decided to move them from beside the cabin to the nearby transition float. This will get weight off our cabin's float, and give them a sunny spot to thrive. Winter is a good time to transplant and prune because plants are dormant. Production last year was minimal, so I'm hoping the change will stimulate growth and fruiting. Pruning and then transplanting three blueberry plants. Transplanting was needed because the pots were too heavy to move. Plus, I wanted to check on the roots. 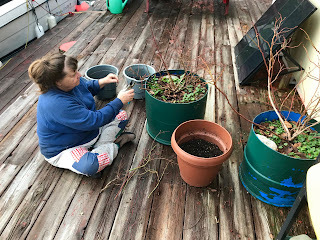 I pruned aggressively to focus the plants' energy for fruiting. I was please to discover they weren't root bound. I loosened the roots before putting them into their new containers to encourage growth.. I loosened the root balls before replanting. I put compost in the soil then added bone meal and ground egg shells before placing the plants in the new containers. Last summer the visiting Garden Club members brought me a third blueberry to add to my grouping. Having several varieties helps with pollination. The shorter Northsky goes in the middle. My Northsky is shorter so I put it in the middle. It's flanked by the taller Duke and Bluecrop from the Garden Club. I put stakes in to help train the two taller varieties upward rather than outward. Transplanted volunteer pansies from the blueberry pots. 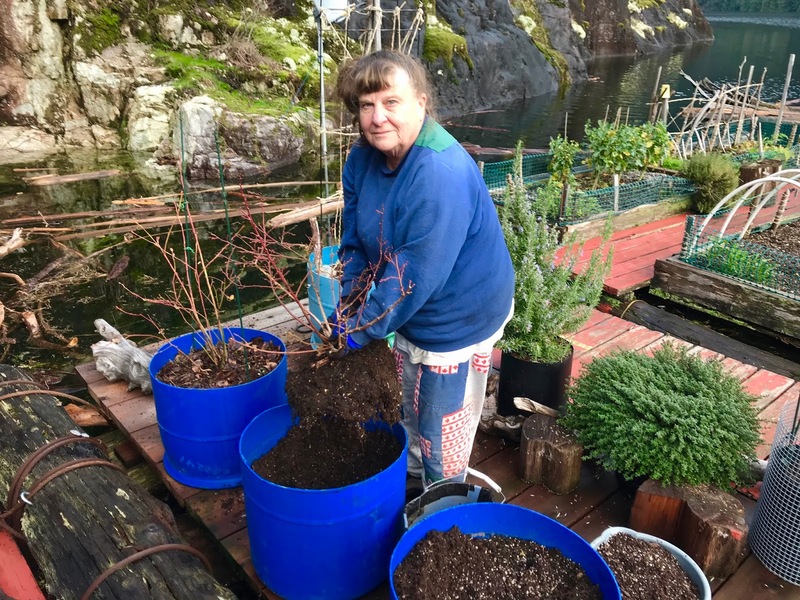 Last year I practiced chop and drop composting and mulching. 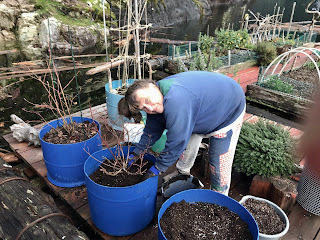 Pansy cuttings went into the blueberry pots. 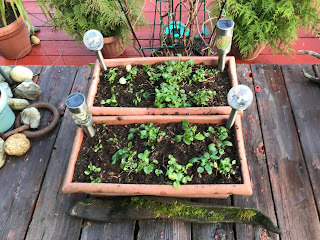 I transplanted them roots and all into my deck flower containers. After a week they still looked healthy, so I'm keeping my fingers crossed for early spring flowers.